Totes are delivered personally (not mailed) within the Augusta, GA area. If you are requesting a tote for yourself or someone who lives in the Augusta area, a Lydia volunteer will bring the tote directly to you or your loved one. 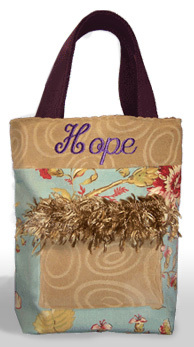 You can also come by the office (M-F 9am-3pm at 1369 Interstate Parkway, Augusta) and select the tote you’d like for yourself or delivered locally or shipped worldwide for a woman coping with cancer.